Dungeness crabs are available year round all along the West Coast, in particularly in the Pacific Northwest. They are large, averaging about 2 lbs. each, and offer tender, briny, succulent meat. The nutritional information applies to one whole cooked Dungeness crab. A medium-sized crab yields about 7 oz. or 1 1/2 half cups of meat, which contains 140 calories. That is about 7 percent of the recommended daily value for calories, based on a daily diet of 2,000 calories. The calories in 7 oz. of Dungeness crab consist of 120 calories from protein, 14 calories from fat and six calories from carbohydrates. A whole crab contains 28 g of protein, which is 20 percent of the daily value for protein. The U.S. Department of Agriculture considers Dungeness crab an excellent source of protein because it provides 20 percent of the Recommended Daily Value. 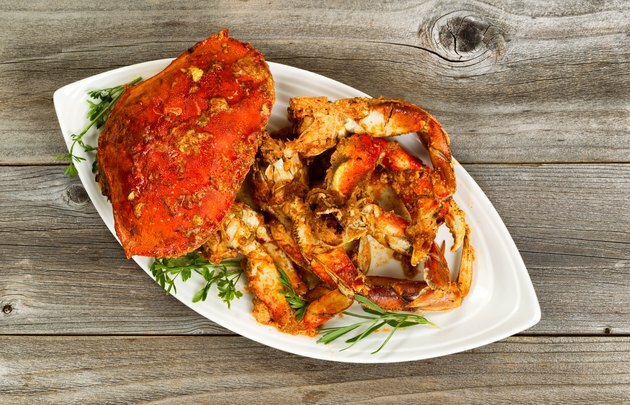 Dungeness crab also contains rich supply of zinc, copper, calcium, magnesium and iron as well as all of the essential amino acids, while remaining low in fat and calories.